Situational awareness: Google has been hit with its third antitrust fine over the past two years by the European Union, this time for $1.7 billion for stifling online advertising competition, per CNBC. San Francisco readers: Join me for breakfast tomorrow at 8:30am! I'm going to be moderating a series of conversations digging into San Francisco's housing crisis and its most innovative solutions. It's part of the kickoff for the 2019 portion of Axios' Hometown tour. RSVP here. Also, the link I included yesterday was for the wrong (aka men's) tournament. If you want to take part in the 2nd annual Login Women's NCAA Tournament Challenge, go here. If you aren’t a gamer it's easy to miss why Google’s new Stadia streaming game service is such a big deal. But it is, and here’s why. For gamers, Stadia offers the potential to make several long-held dreams a reality. Players can compete across all manner of devices, including phones, TVs, tablets and computers, and a game they pause on one device can resume on another. Gamers can stream their play directly to YouTube at the press of a button. They can also share a game's state at any point for others to pick up right where they left off, opening up new kinds of challenges for friends and fans. But Stadia's innovations are about more than just the future of gaming. If Google can stream the most demanding applications to a TV with a Chromecast streaming media stick, it really can turn any screen into a powerful computer. Beginning later this year, Stadia will allow consumers to stream games to a range of devices at, Google promises, up to 4K resolution at 60 frames per second — thanks, in part, to custom graphics processors from AMD running on its cloud servers. 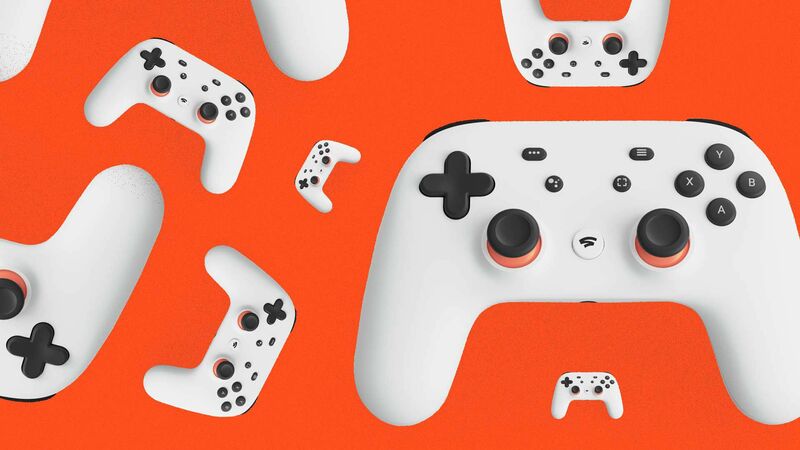 Stadia can work with existing game controllers, but Google has its own Stadia controller with built-in buttons for sending game play to YouTube and summoning in-game help via Google Assistant. The big picture: Google isn't alone in seeing the potential of cloud-based gaming. Microsoft and Amazon, both of which have big assets in gaming and significant cloud operations, are also said to be interested. Yes, but: Google left some big questions unanswered. Business: Google isn't saying how much the service will cost and how it will split revenue with game developers. Device support: It's not clear exactly which devices will be supported and when. Google made specific references to TVs via Chromecast, Chromebooks, computers running the Chrome browser and Pixel phones and tablets. But it also said it wants to expand support further over time. Performance: Google talked about resolution and frame rates, but what it can provide under different conditions is unclear. Plus, there are concerns that even if Google gets everything worked out on its end, the service could be tough going for anyone who lacks the fastest of network connections. Our thought bubble: Google has long been building an "everything computer" in its cloud — one big machine that already handles most of the world's search, much of the world's video, a ton of advertising, a huge volume of email, and so on. Gaming is just the sort of hardware-intensive, boundary-pushing activity that, you'd think, would be least suited for the Google machine to handle. By saying that its giant cloud brain is now ready to meet your split-second gaming needs, too, Google is saying that there's practically nothing it can't do. The American Civil Liberties Union has reached a historic legal agreement with Facebook over advertising practices that allegedly discriminated against minorities. As Axios' Sara Fischer reports, the agreement will mean less targeting options for ads related to jobs, credit or housing. As part of the settlement, Facebook will pay $5 million to several groups, including the ACLU, the National Fair Housing Alliance and the Communications Workers of America union. It will also take 3 new steps to prevent advertisers from engaging in unlawful discrimination around employment, housing, and credit ads on Facebook and its subsidiaries (like Instagram, WhatsApp and Messenger). 1. Facebook is creating a new advertising process, specifically for marketers that are purchasing ads around employment, housing and credit. The new process will guide ad buyers through a separate portal that will certify that advertisers understand the policies and legal specifications around targeting population segments. As part of this process, Facebook is further cutting the number of options advertisers can use to target ads. 2. Facebook will set up an archive for housing ads, which could be similar to the ad archive it built around politics. Once built, anyone searching for a housing ad in the U.S. will be able to search all housing ads active on Facebook, regardless of whether the ads are targeting that specific person. Facebook will start testing this feature by the end of the year. 3. Facebook says it will continue to roll out education and certification requirements globally around all of its advertising policies. AT&T and Comcast say they have reached an inflection point in the fight against robocalls by demonstrating they can authenticate calls across networks. Comcast and AT&T tested the authentication mechanism (which uses an industry-developed protocol known as Shaken/Stir) on March 5. They used standard consumer equipment and networks, not lab gear. It's believed to be the first exchange of authenticated calls across networks. AT&T and Comcast say they plan to offer authentication to calls between networks later this year. Why it matters: Being able to prove a caller is who they say they are is a necessary starting point in cracking down on fraudulent calls. This only works if you can do it across voice providers. For years, Instagram has been a key destination for marketers to showcase their fancy leggings or eco-friendly sneakers. And the Facebook-owned photo sharing app has benefited through sponsored posts. What's new: Now Instagram is looking to make money another way. The company is setting up a program allowing people to buy things directly on its app from their favorite brands, while taking a cut. Why it matters, per Sara: If successful, this would be an opportunity for Instagram to expand its business way beyond ad revenue. While there is room for Instagram's ad business to grow, having multiple streams of revenue is probably more sustainable. The mobile advertising economy is expected to grow roughly 13% between 2017 and 2021, per PwC, which means that there's still room in the short term for Instagram to grow its roughly $8 billion to $10 billion annual ad business. But as the mobile ad industry matures, that growth rate will inevitably slow, and Instagram — like its parent app Facebook and all other mobile advertising-based apps — will need to begin to think about ways it can make money outside of advertising. Instagram currently makes up around 20%–25% of Facebook’s $40 billion annual ad business, according to eMarketer projections. The CanSecWest security conference kicks off today in Vancouver. Longtime Waze executive Di-Ann Eisnor has joined WeWork's parent company to head future cities efforts, along with designer Dror Benshetrit. Former Uber engineering executive Paw Andersen is joining Metromile as CTO. Kickstarter CEO Perry Chen is stepping down from that post but will remain board chairman. Enjoy some slow-motion snow, thanks to "Ask Amy" columnist Amy Dickinson.